Replaces control module for Si and Si-PLUS chlorine generators (only Si-45, Si-45 PLUS, Si-60, and Si-60 PLUS). 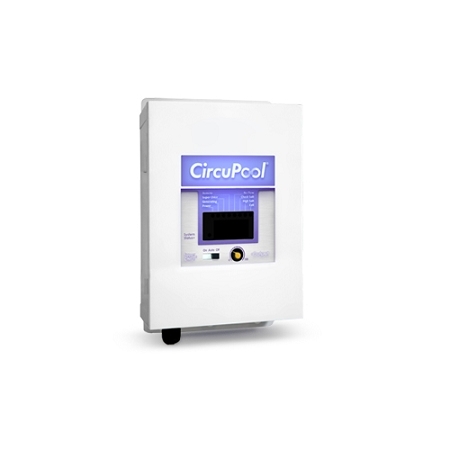 The CircuPool Si controls are a steel sheet-metal box with a hinged and latching door (similar to your circuit-breaker panel). It mounts on the wall (or nearby a post or support) by hanging the control box by a few keyholes on basic screws that have been secured in the wall. Inside of the Control Center door, there is a small LCD display screen (similar to a digital watch), which displays the average salinity reading, temperature, cell volts, cell current, chosen percentage chlorine output, instantaneous salinity, and different cell type settings. The controls have a dial that is used to raise and lower chlorine output, and a three-position switch to activate the system, deactivate the system, or activate the super chlorination mode.